Coral Island is a popular Thai beach island resort and is also called as “Koh Larn”. It is located at 7 km from Pattaya. For those visiting Pattaya, the Coral is not the first getaway option that springs to their mind when they are looking to flee the hustle and bustle of Pattaya. But it is surely the best option for those who want to enjoy a day in the sun on a beautiful beach, overlooking the crystal blue ocean. It won't be wrong to say that the Coral Island is literally heaven on Earth. If you want to take a day trip, then it is a short boat ride from the Walking Street. Owing to the short distance, a day trip is easily manageable. Information is available at all hotel receptions, but a guided tour would be a better idea. Coral offers a range of different water activities ranging from scuba diving to snorkeling. Owing to its short distance from Pattaya, it has been a huge hit with tourists who want to enjoy a day out in the sun without the noise and crowd of the busy beaches that are centrally located in Pattaya. The only mode of transportation between Pattaya and Coral Island is by sea. It is a short ferry ride which can be taken in Pattaya city. Coral falls on the left of Pattaya whereas Bangkok falls towards the Northwest direction. So, for those visiting Bangkok and wishing to go to the Coral, they can go from both their hotel and directly from the Suvarnabhumi Airport. 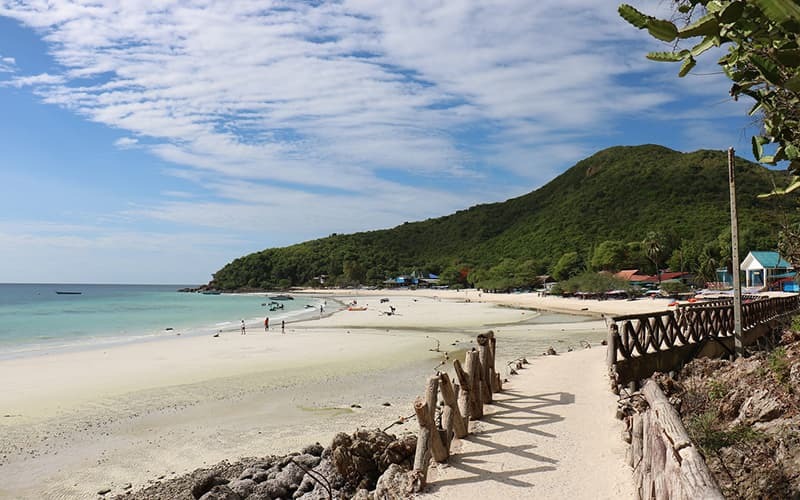 Koh Larn is a popular day trip destination as well. It is around 7 kilometers away from the coast. Coral Island is not just a beach to relax in but also offers a few island activities for those seeking adventure. For the adventurous sorts, there is a boat ride, on a boat whose bottom is made of glass. This allows the passenger to take in the beauty of nature as they can see all the colorful fishes, sea urchins, and sea sponges deep down. If relaxing, dipping your feet in the pristine sand, swimming and sunbathing are too boring for you then, in that case, you can choose from the more adventurous options of either going for a banana boat ride, parasailing, kayaking or hiking into its forested interior. The lunch available is a buffet and consists of a huge variety of freshly caught seafood. If you want to stay longer there are several hotels and bungalows that available at reasonable rates for those who believe a day trip is too short to fully enjoy the Corals beauty. The central village in the island is named Na Ban. It's mainly the local people's residential area. The more popular beaches in Koh Larn are located towards the West of the island. Amongst the top ones, some have been mentioned here. This beautiful, sandy beach with crystal clear water is roughly 500 meters long. Keeping the safety of swimmers in mind the swimming area has been fenced. For those looking to sunbathe and relax, beach chairs are available for rent at reasonable prices, ranging from 50 to 100 Bahts, as per the season. There are numerous beachfront restaurants that serve delicious, freshly caught and cooked seafood, a variety of exotic Thai food and ice-cream. Each restaurant has a bar that serves amazing drinks and fresh juices. Staying the night at the beach is possible thanks to the well-built resort situated at the end of the beach. Its building looks like a ray whereas it has solar panels on top of its roof. For going to the Samae beach you have two options. Either you can charter a speedboat from Pattaya or you can rent a taxi from Koh Larn's ferry ports named Tawaen beach pier or Na Ban pier. 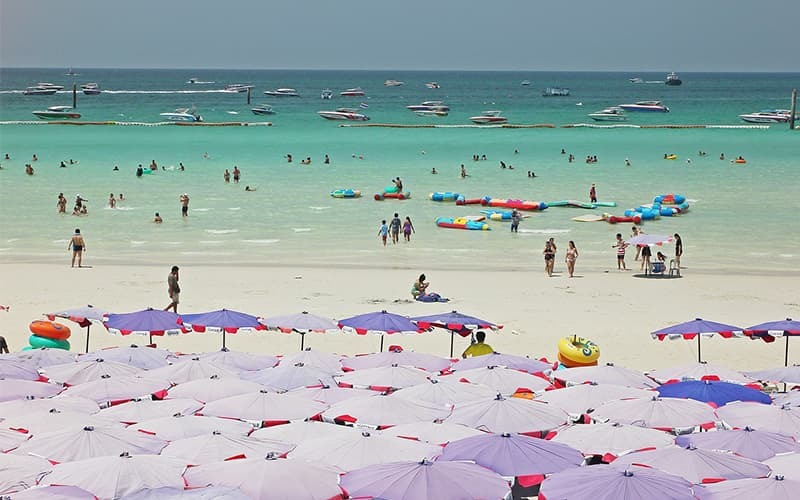 Tawaen's beach is another popular beach of Koh Larn that is a huge hit with the visitors. It's very crowded during the peak tourist season. Owing to its popularity this beach has countless good quality restaurants that serve not only fresh seafood and Thai food but also International food. You can sit back and relax on your beach chairs while the cocktails, fruits and ice cream you ordered are served directly to your chairs. Apart from good food, this beach offers several exciting activities which include Jet Ski and banana boating. To reach to the Tawaen beach you need to rent a speed boat on the coast of Pattaya. The other option is taking a ferry from Bali Hai Pier. For those who wish to stay the night, those visitors can choose from several well-maintained resorts. Another attractive beach with pristine white sand is the Tien Beach. 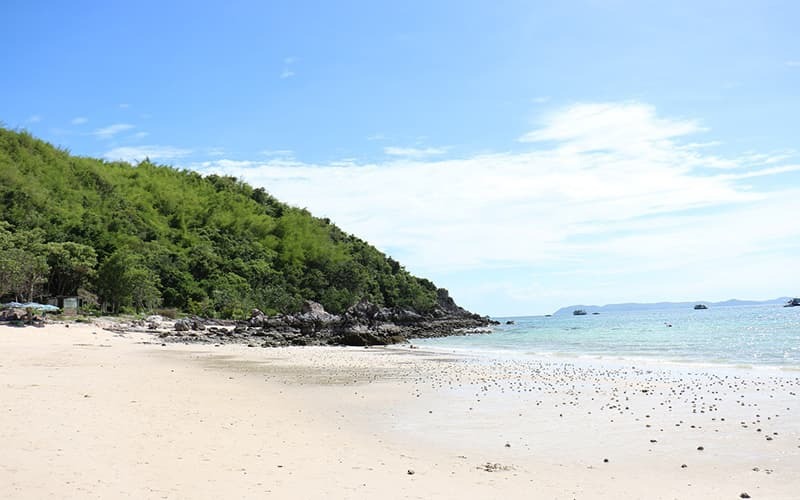 Though slightly smaller than Samae and Tawaen beaches, it makes up for its length with a gorgeous lineup of palm trees as well as the breathtaking view of Koh Larn Island's timbered interior situated at its back. Despite its beauty, it is one of the lesser crowded beaches on the island. Therefore, restaurant variety and accommodation options are few. A rented speed boat from Pattaya takes you to the Tien Beach. Another option is using a ferry to travel from Pattaya. The ship will take you to either of Koh Larn's two ports namely Na Ban pier or Tawaen beach pier. Once there you can rent a bike or taxi to the beach. You must walk the last bit as there is no direct road that leads up to the beach. If you are a true nature lover and looking for scenic beauty, then Khao Nom viewpoint is the spot for you. It is located close to the Samae beach and will surely take your breath away. Not only does it give you a beautiful view of the island's forested hilly interior, but it also highlights the Samae beach and its crystal-clear waters. Closeby islands located in the Gulf of Thailand are also visible from here. In fact, on a clear sunny day, Pattaya can be seen from here too. The commute on the island doesn't cost much. You have the option of taking a bike taxi to go around or you can also take a Baht Bus, popularly known as the songthaew amongst the locals. Rates vary from 30 to 50 Baht depending on the time of the year and the distance traveled. Several shops offer motorbikes and bicycles on rent as well. Beautiful as the Coral is, it would be advisable that prior to leaving the hustle and bustle of Pattaya in favor of the Islands' beauty and serenity, that you consider taking a guided city tour of the city. Especially visiting the Pattaya Floating Market is a must and truly an experience. The Nong Nooch Tropical Garden is amongst the popular to visit destinations as well.